Treasured for its beauty and majestic simplicity, the calla lily is a popular choice for wedding bouquets, centerpieces and favours. 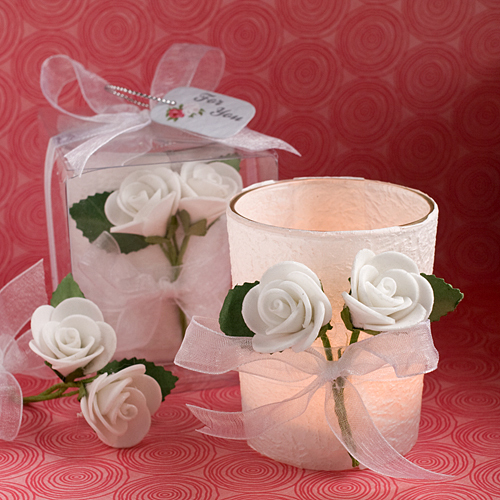 And, this candle favour really shines a light on the calla lily's charm. Measuring 2.5" x 2.5", each candle favour has a clear glass holder delicately wrapped with white textured paper and a central white organza ribbon over three long stemmed calla lilies gathered in a mini bouquet. A white tea light candle is included. 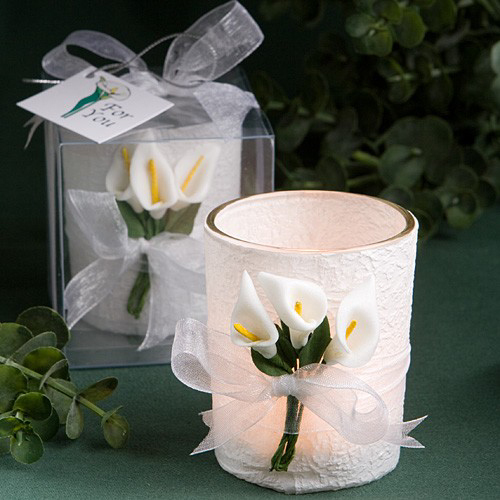 Each calla lily themed candle favour comes packaged in a clear acetate box, wrapped and tied with a white organza ribbon and an attached matching design "For You" tag.